During class levels 11 and 12 Diploma years 1 and 2 are conducted. Here the content of the IB Diploma Programme® is taught. The students take six subjects from at least five of the six DP subject groups, three of these as higher level subjects (HL) with a higher amount of study content and classes than remaining standard level (SL) subjects. These levels are similar to the levels in the German Abitur profile and additional subjects. Each HL subject is taught during the course of two DP years at a minimum of 240 hours. SL subjects total 150 hours minimum each. 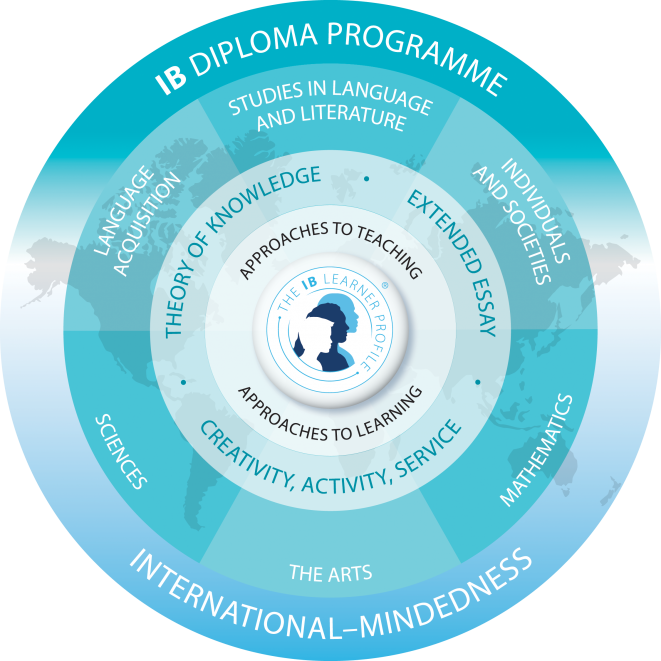 The IB Diploma Programme includes the core elements and six subject groups. Theory of Knowledge (ToK) ToK is a subject of 100 hours during DP years 1 and 2. Here, students explore the meaning of knowledge, how we obtain knowledge, and how we gain new knowledge. Familiar knowledge will be scrutinized. In short, independent learning is developed here. Creativity, Activity and Service (CAS) In this core element students can nurture their talents and organize projects that have a benefit to society. The aim of this element is to foster the personal development and creativity of the students. Extended Essay (EE) Students write a 4000 word academic-style essay about a topic of their own choice. This research question has to lie in the field of one of the six subject groups of the DP. Here, students have to handlea topic of their choice on their own over a longer period. All subjects but German Language are taught in English. This set of offered subjects is recognized by the Kultusministerkonferenz of Germany and thus ensures that graduates can apply with their IB certificate at a German university. As of spring 2017 non-German speaking students who possess very good self-learning skills can commence in a self-taught Language A – Literature subject of their mother-tongue supported by our school. This layout is accepted by the Kultusministerkonferenz of Germany and thus ensures that graduates can apply with their IB certificate at a German university.